doug: Should Canada grant sanctuary to American war resisters? Should Canada grant sanctuary to American war resisters? During the Vietnam War Canada was a sanctuary for more than 50,000 American war resisters. Since the Iraq War began in 2003, roughly 200 American soldiers have come north to avoid fighting in what they consider an “illegal war.” However, they’re no longer able to become landed residents, so many have applied for political asylum. 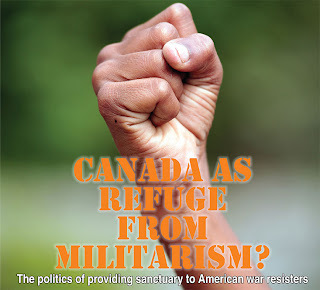 Should Canada grant sanctuary to American war resisters? Or should it deny them refugee status and deport them? Grab your lunch and join the debate next Tuesday when Douglas holds a free, public panel discussion on Canada’s role in providing refuge for American soldiers fleeing the Iraq war. Presented by the Douglas College Institute for Ethics and Global Justice, the brown bag lunch forum – Canada as refuge from militarism? The politics of providing sanctuary to American war resisters – takes place Tuesday, February 22, 12-2pm at David Lam, Room A2050. Forum panelists include Fin Donnelly, MP, New Westminster-Coquitlam/Port Moody; Sarah Bjorknas, an activist with the national War Resisters Support Campaign; and Larry Martin, a Vietnam War era American draft evader and Coordinator, Vancouver Committee to Aid American War Objectors (1969-74). “Under the Harper government, Canada has already deported two war resisters, and they have been put in prison,” says forum moderator Jeff Schutts, a former US Army officer and History Instructor at Douglas. Jeff, who is also Co-director of the College’s Institute for Ethics and Global Justice, says it seems likely that a majority Conservative government would deport more of them. For more information on the event, contact Jeff Schutts.